“This is designed as an easy-to-wear pullover for an active girl. It is knit from the bottom up in the round to the armpits, then back-and-forth for the shoulders. For the ease of the girl just learning to dress herself, the front and back are the same. The length is just long enough to be fancy and just short enough to stay out of the way for playtime. 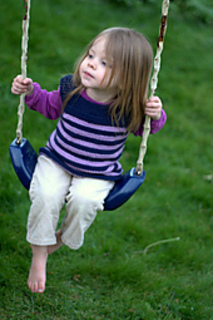 Knit it with some soft yarn in your little girl’s favorite color! Errata: The yardage indicated in the pattern is incorrect. I should read, “420 yards of soft yarn”.